These photographs show the ground breaking ceremonies for the C. F. Menninger Memorial Hospital. This took place on Dr. C. F.'s 90th birthday. Dr. C.F. Menninger and his sons, Dr. Karl and Dr. Will, founded the Menninger Clinic for mental-health treatment, education, research, and prevention in Topeka in 1925. This addition to the 'East Campus' was in 1952. 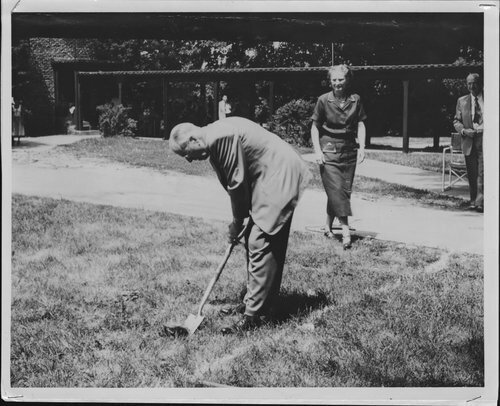 Groundbreaking ceremonies for the C. F. Menninger Memorial Hospital in Topeka, Kansas - Dr. C. F. throwing the first shovel of earth.